"These crepes are good with Indian food. 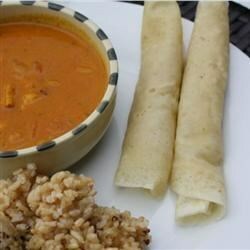 I developed them to serve with vegetable biryani and other dishes after trying some leftovers in a regular crepe." Heat a non-stick crepe pan over medium-high heat. Whisk flour and water together in a bowl. Add egg and mix well. Whisk butter, salt, and caraway seeds into flour mixture to form a smooth batter. Pour about 1/4 cup batter into heated pan. Tilt the pan around so the batter forms a nice round shape. Cook until bubbles form throughout the batter, 2 to 4 minutes. Flip the crepe by using spatula to loosen it from the pan. Flick your wrist upwards to give the crepe a toss, flipping it, and landing it back in the pan. Cook the second side until lightly browned, about 30 seconds. Repeat with remaining batter. If you stack the crepes on a plate as you go, you don't need to worry about the ones that get a little stiffer. Being next to the other warm crepes will make them softer and stretchier. Don't bother placing anything between them, they will not stick, or they will peel easily off of each other.